Available from Amazon in e-book, print and audiobook Now! For Vietnam veteran turned wildlife ranger Nick Drake, the war at home proves just as deadly. Harney County, Oregon, 1968: Nick Drake has a chest full of medals and enough demons to fill a duffle bag. He’s been trained to kill, but never retrained to rejoin society. 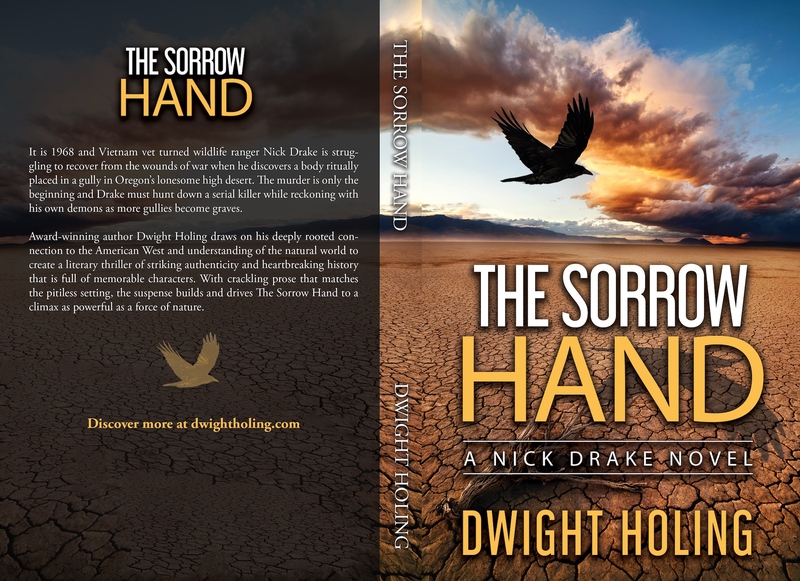 Drake flees to the lonesome high desert in search of redemption and takes a job patrolling wildlife refuges where the only conflicts are keeping out stray cows and ticketing poachers. But then he stumbles across a girl’s body ritually placed in a gully. 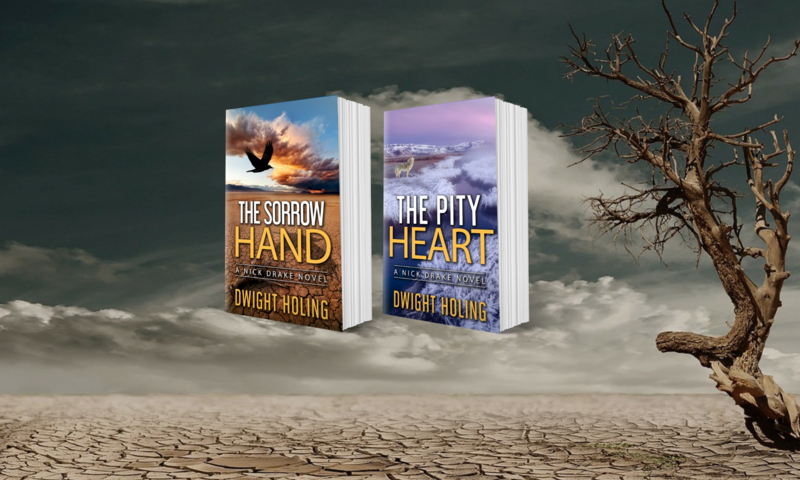 Her murder is only the beginning, and Drake must face humanity’s heart of darkness once again if he’s to stop a killer from turning even more gullies into graves. Available from Amazon in ebook and print Now! 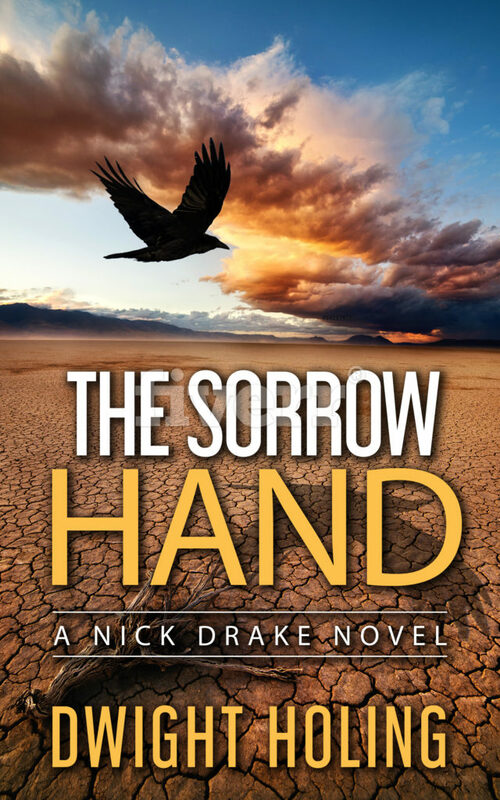 Nick Drake returns in the thrilling sequel to The Sorrow Hand. A contemporary western thriller. 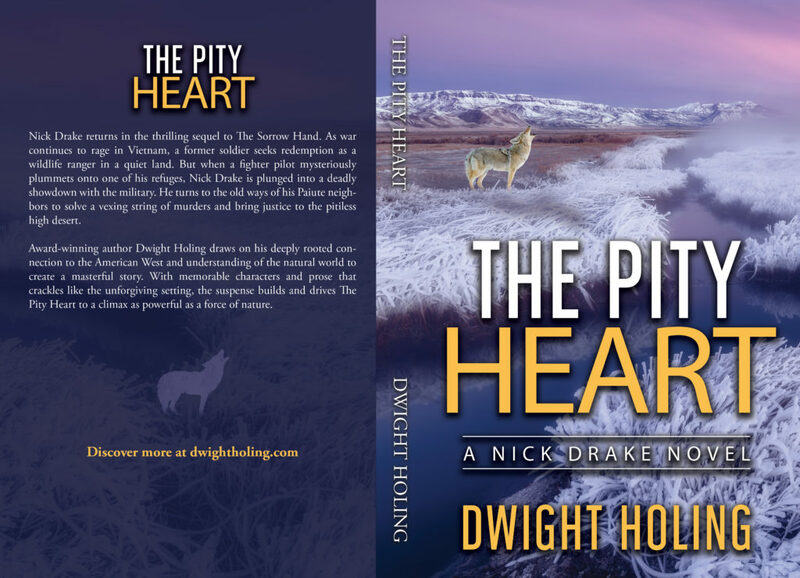 Set in 1968, Nick Drake is a troubled Vietnam War veteran seeking redemption as a game warden in a quiet land. But when a fighter pilot from a nearby Air Force base mysteriously plummets onto one of his refuges, he is plunged into a deadly showdown with the military. 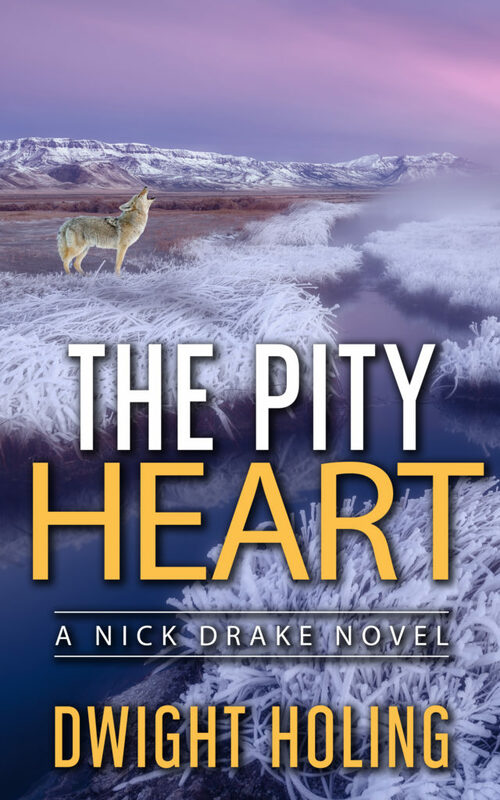 A vexing mystery involving multiple murders ensues, and Nick must turn to the old ways of his Paiute neighbors to hunt for a vicious killer and bring justice to the pitiless high desert. The cattails were stiff with rime, and the frozen blades of sedges looked sharp enough to slice. I wore a down vest over my ranger uniform and wool gloves with the trigger finger cut off. A thin covering of snow crunched beneath my boots as I hoisted a canoe from the bed of the pickup and carried it to the edge of the lake. The shallows were slushy and a pair of mud hens squawked as I shoved off. Sunrise was still an hour away. I hugged the shoreline as I paddled quietly toward a distant marsh. The fall migration was winding down, but ducks and geese by the thousands were still touching down on Malheur Lake each evening to rest before continuing their long journey south. Some were headed to Mexico, others all the way to South America. The government was paying me to give the birds a fighting chance. Only a year ago it had paid me to do the same for the South Vietnamese. A poacher was treating the lake as his personal slaughterhouse. He wasn’t the first illegal hunter I’d encountered since moving to Harney County, Oregon, following three tours capped by a six-month stint at Walter Reed Hospital, but he was sizing up to be the most heartless. The first time I heard blasts coming from across the wildlife refuge, I thought there were a dozen shotguns firing away. It turned out it was only his. He’d made a Gatling gun out of five 12-gauge barrels and mounted it on a swivel in the bow of a boat fitted with a blind made of chicken wire braided with fresh tules. He maneuvered the boat close to a raft of ducks and geese and then fired through an arrow slit, knocking down scores of birds before they could take wing. When he spotted me, he quickly scooped up his kill with a long-handled net and sped into a marsh. The next time I saw him, I was in my canoe. He disappeared into another marsh. I paddled after him, but he doubled back to where I’d left my truck and slashed an X across the US Fish and Wildlife Service emblem on the door. He stabbed all four tires to boot. I had spent a lot of time talking with other combat veterans about the need to control our anger and curb our thirst for revenge. To a man, we all said we could handle it on our own. We were lying, the same as we lied about our flashbacks, guilt, and drug abuse. I told myself it was only a truck and I wasn’t angry nor desired retribution. But I wasn’t about to shirk my duty. Good people who believed I deserved a second chance had put their reputations on the line by recommending me for the job, and I learned on the battlefield that trust was more important than courage. You never squandered it, you never betrayed it. After my second encounter with the poacher, I made a blind of my own on a rise overlooking the refuge, set up a spotting scope, and waited for him to return. He came back two days later, and I studied his movements for three more to learn his habits. He stuck to a pattern, moving from marsh to marsh in a clockwise direction. The marshes provided him cover and access to the open water where the big flocks of waterfowl rested in the middle. The poacher mimicked a beaver, always leaving himself at least two back doors for escape. Since I was the only ranger in a district as big as some states, he no doubt assumed I could only choose one at a time. That was his mistake. I had no intention of chasing him again. The top of Steens Mountain turned golden with alpenglow as I continued paddling. The birds took the changing light from the rising sun as their cue and started to stir. I could make out flocks of blue-winged teal, harlequin ducks with heads as masked and colorful as a court jester, and the spoonlike bills of northern shovelers. Tundra swans mixed with snow geese. Canada geese outnumbered both species four to one. The muffled drone of an outboard motor supplied baritone to their quacks and honks. The poacher was making his way along a channel in the marsh right ahead of me. He was sticking to his pattern and would enter the open water, cut the engine, and let the current push his blind silently toward the biggest rafts. When he drew as close as the broadside of a barn door, he would launch his murderous fusillade. I eased my canoe into a thick stand of cattails, crouched low, and waited. The outboard stopped put-putting. The boat coasted into view. The camouflage only went around the bow and sides, leaving the stern open. The poacher tilted the outboard to raise the propeller from the water. Then he slipped an oar over the stern and used it as a rudder to steer his blind toward the unsuspecting waterfowl. I judged his speed at two miles per hour, did the math, and came up with a yard per second. A 12-gauge shotgun firing birdshot had an effective kill range of fifty yards. I counted to sixty before exiting the cattails and swapping the paddle for my Winchester. His head jerked around. He wore a greasy billed cap with sheepskin-lined earflaps that were blackened from chewing tobacco dribbling from the corners of his mouth. He bared horselike teeth that were equally stained. “You will when I cuff you,” I said. The poacher stopped talking. He was stalling, thinking that the longer he could keep the paddle out of my hands, the sooner my canoe would broach and cause me to lose my line of fire. That would give him the chance to rush for his 12-gauge machine gun and swivel it toward me. I leaned to starboard and pressed my right knee against the gunwale to counter the drift while holding the Winchester steady. “Am I?” I levered a fresh cartridge. The clank of the brass entering the chamber was followed by thunder booming in the distance. The poacher looked up, but I kept my eyes locked on him. The thunder boomed again. It struck me that I hadn’t seen a cloud since paddling away from shore. A shadow that was neither duck nor goose darkened the water, and then came a familiar whine that turned into a shriek, followed by two more sonic booms. Four fighter jets flying in close formation screamed low overhead, their afterburners turning the glassy surface of the lake into froth. I ducked instinctively and then grew angry at myself. I hadn’t had a flashback for a while and thought I was over them. I started to raise my head when the explosions came in quick succession, metal pinged on metal, and shrapnel flew all around me. I ducked lower. I couldn’t recall having ordered my squad’s DJ to radio for air support. No matter, the fighter jets were here, and their pilots were making the cold, split-second calculations that risking scouts’ lives might save an entire company marching behind. “Here it comes again,” I yelled to the men, but couldn’t hear their replies over a renewed round of rapid-fire explosions. Bomb fragments whistled around me. More explosions came, one after another, beat upon beat upon beat, until they all rolled into one continuous drumming that seemed to rise up and pass directly overhead. Rain began to splatter. Droplets of water fell from the webbed feet and downy bellies of thousands of spooked birds taking off from the lake as one. Daylight streamed through dozens of BB-sized holes in the bow of the canoe. Birdshot rolled around in the bottom like it was in a pinball machine. I watched as the motorized duck blind disappeared into the marsh, the poacher holding the outboard’s tiller with one hand, the other raised high in the air with the middle finger extended. I looked up at the sky. Four jet trails snaked lazily overhead as I worked to keep the perforated bow above the water. The fighters had come from the west. The closest base was Kingsley Field in Klamath Falls, home to an Air Force interceptor squadron that also served as a training base for pilots readying for the war. I was sure the trainees who’d roared by were eager to get into the action overseas. Fighter pilots were cocky by nature, but experience told me when the cherries got in-country, they’d quickly discover being in the real deal was nothing like buzzing birds on a lonesome lake in the high desert. North Vietnam’s air force consisted of little more than a handful of cast-off MiGs, but its mobile batteries of surface-to-air missiles were scoring plenty of direct hits, four hundred in one year alone. I knew that for a fact because my squad of 1st Cavalry Army scouts had been tasked with searching for downed pilots along with our usual job of tracking the enemy. The air was warming as the sun climbed higher, and I was closing in on the spot where I’d left my truck. I started paddling faster at the thought of the poacher doubling back to work over the Ford with his blade again. A distant whine caused me to look over my shoulder and slow my strokes. Three black dots appeared on the horizon. The fighter jets were back and closing in fast. They were returning to their home base after the training exercise and were on a path to pass right overhead again. I was wondering where the fourth went when I spotted it trailing behind. The three zoomed by. When the fourth reached the lake, I couldn’t hear its turbine. A loud bang punctuated the silence. The bubble canopy snapped off and tumbled away. Red flashed and the copilot shot straight up from the rear of the cockpit. The jet kept going. I recognized it as a F-101 Voodoo. I turned back to the skyrocketing copilot still strapped in his ejection seat and waited for it to release and fall away and for the parachute to deploy. Neither did. Up he went until gravity took over and then down he plunged. The water erupted where he hit. I didn’t wait to see if the pilot ejected too or if the fighter crashed and went up in a fireball. I was busy paddling my crippled canoe to the splashdown. Bubbles marked the spot. I kicked off my boots and scrambled over the side. The cold punched me hard in the chest. I treaded water for a moment as I filled my lungs before jackknifing down. Malheur Lake was fed by snowmelt. The lake spread for miles and was the drain for a 1,500-square-mile basin, swelling in spring and shrinking in summer. It never got very deep. The seat had landed right side up in a thick bed of mud. The copilot was still sitting. I grabbed his flight harness and tried to pull him. He wouldn’t budge. My eyes stung as I struggled to keep them open in the murky gloom. He was belted to the seat by five straps that all connected to a round buckle above his crotch. As I worked to rotate the buckle to spring the release, I searched for signs of life. He still wore his oxygen mask, but its hose had ripped free from the air tank and now floated above his head. I peered into the helmet’s visor, trying to make eye contact, but the tinted plastic was too dark. “Lt. Ramirez” was embroidered on the chest of his flight suit. The word “Toro” and a pair of bull’s horns were painted in red on the top of his helmet. My lungs burned. I gritted my teeth, clamped my lips to keep from taking a breath, and finally twisted the buckle open. The belts released and I grabbed the copilot’s flight harness again, wrenched him loose, and kicked for the surface as white lights strobed. The cold air tasted sweet as I sucked it in. The canoe had drifted away. I hooked my arm across his chest and swam for shore. The distance wasn’t far and the water was shallow. I scrambled the last ten yards, half carrying, half dragging him. Once I hit solid ground, I unfastened his helmet. His pupils were fixed. He wasn’t breathing. I rolled him on his side and slapped his back. Water drained from his mouth. I started resuscitation. I covered his mouth with mine and blew in air. I pounded on his chest. I pumped his arms. I rolled him on his side and slapped his back again and repeated the process over and over. I finally gave up and sat next to him. I hugged my knees to my chest and admitted to myself what I’d known all along. Hitting the water without a parachute was the same as hitting pavement. Air Force Lt. “Toro” Ramirez was dead before he’d settled on the bottom.